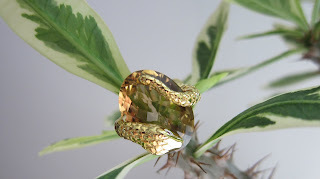 Our new Gaia Snake Ring is now available! The ring features a 20mm x 10mm Beer Quartz and is checker board faceted and is 18k gold plated. The ring will be resized upon request on order, and will take 2-3 weeks.